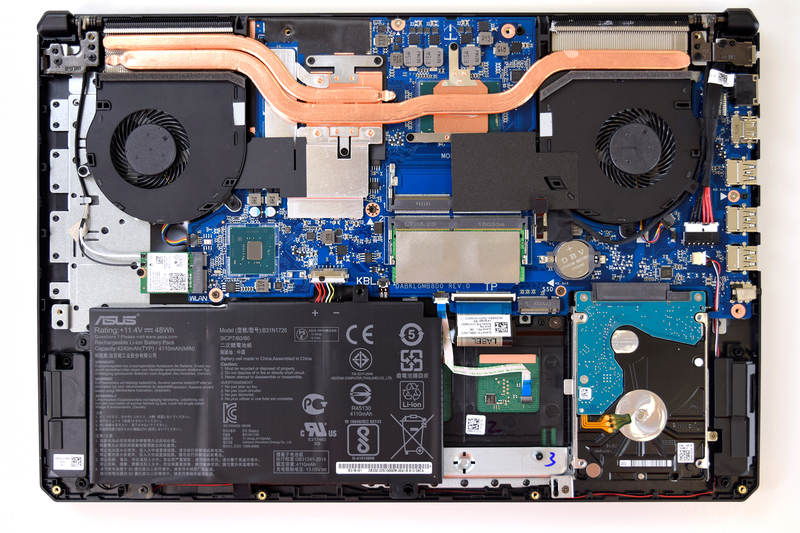 ASUS TUF FX504 features one of the latest CPUs from Intel – Core i7-8750H. In this article, you are going to see how the device looks on the inside and what approach the manufacturer undertook to cool the essentials. Check out all ASUS TUF FX504 prices and configurations in our Specs System or read more in our In-depth Review. 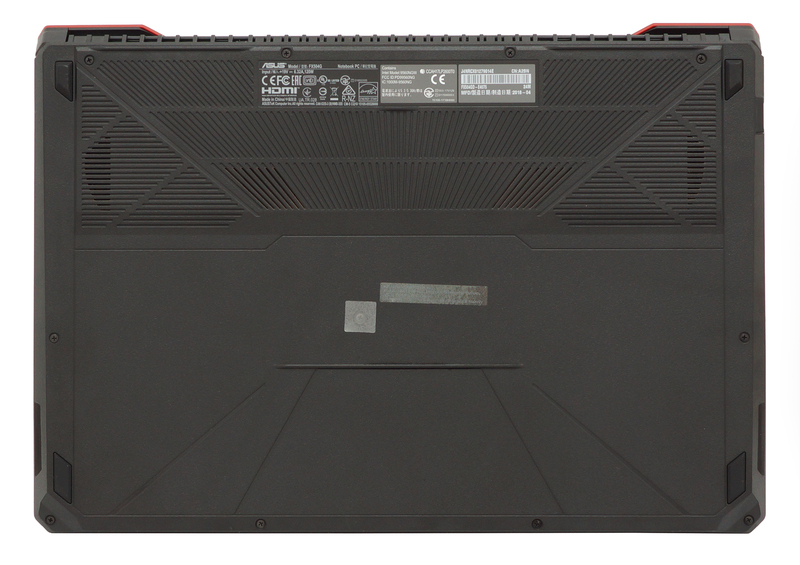 In order to get inside the TUF FX504, you need to remove the bottom plate. When you look at it in the first place you would think that there is a service panel. On further inspection, however, we saw that ASUS is playing games with us, as this is just a texture along the surface. However, getting inside is pretty easy, as you have to remove a total of 11 Phillips head screws. As always, be sure to order them neatly, as some of them differ in size. First things first, here is a look at the two RAM DIMMs. They support up to 32 GB DDR4 memory with speeds up to 2666 MHz – in compliance with the 8th Gen CPUs from Intel. 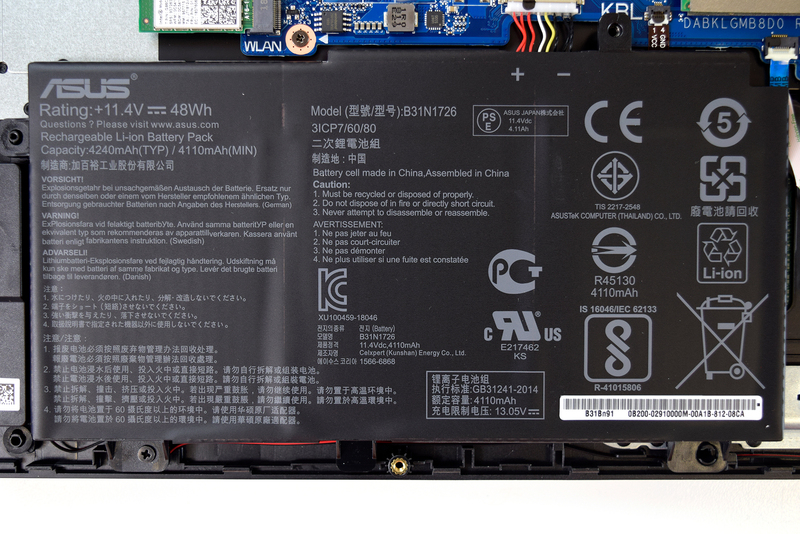 Next, there is the 3-cell 48Wh battery unit. As you can read in our detailed review of the ASUS TUF FX504, it proves a bit too modest for this hardware. In order to remove it, you need to remove the little screw on the bottom. 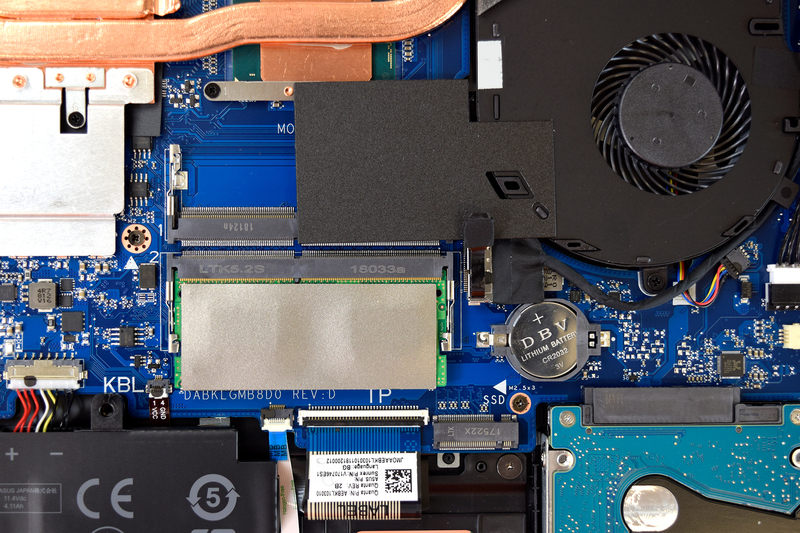 Of course, don’t forget to disconnect the battery connector (found on top) from the motherboard. This is the first thing you need to do when removing hardware from the system. In the right image, you can see the SSHD used for this computer. 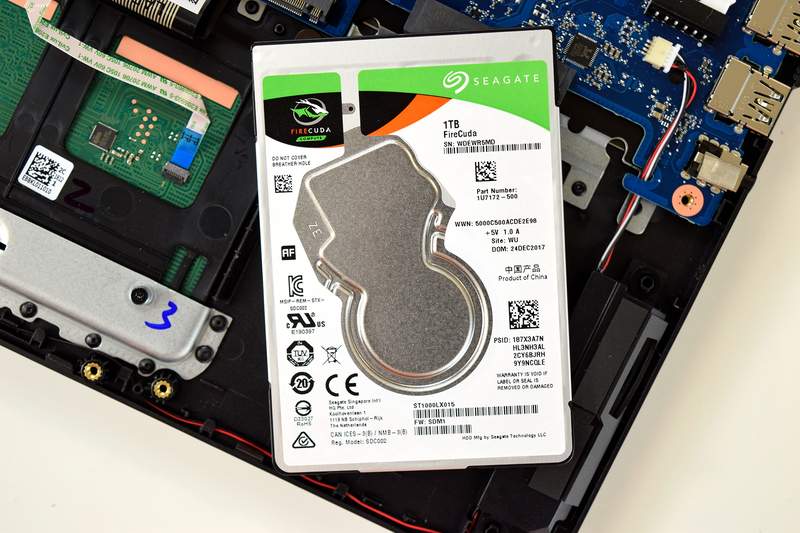 It is a Seagate FireCuda ST1000LX015 and is comprised by 1TB of HDD and 8 GB NAND chips which serve as the cache hard drive. ASUS has opted for a pretty modest cooling in the TUF FX504. At least that’s how the situation seems at first sight (you can find how it fares in our review). Here both the CPU and GPU share a fat heat pipe while there is one small one to aid GPU cooling. Although it may sound weird, there is a positive aspect of this design. When you are using a program that uses predominantly the CPU or GPU, respectively, it will cool the aforesaid chip with both fans. On the other side, if you are playing a very intensive game that is hard on the CPU (like GTA V) things look different. This is where that thermal design starts to suffer. Is it possible to Remove The fan itself from The rotor? Mine went dry and is making noises now. I cant Seem to unplug the Black plastic fan once i get The lit OFF from ontop of it.